Plumb and Level Point Projection Accurately transfers and aligns level, plumb, 90 Degree and grade points. Patented Diamond-Cut Beam Splitter Single diode projects all points for superior accuracy. Smart Pendulum Leveling System - Self-levels senses and indicated out-of level condition, locks when switched off. Robust Over-Moulded Housing - Water and Dust Proof to ensure years of dependable operation. 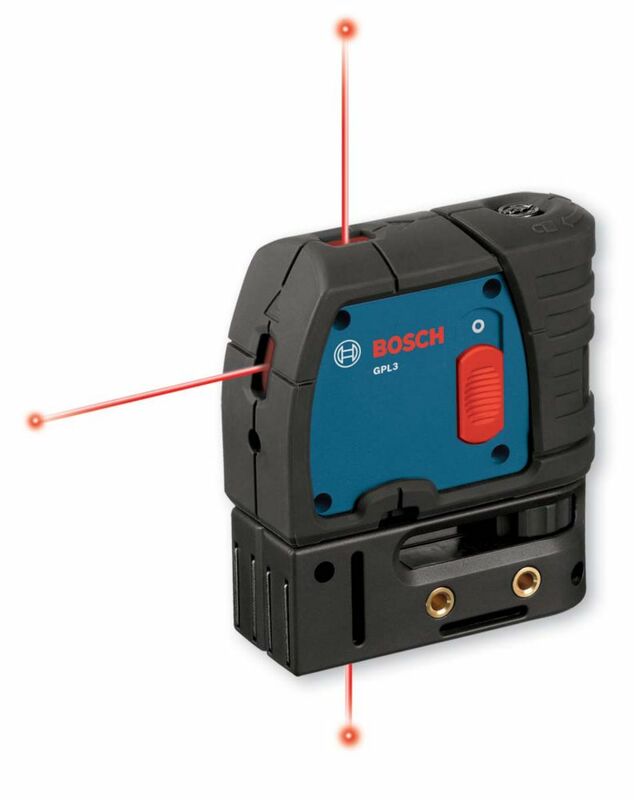 The Bosch GCL100-80C 12 V Max Connected Cross-Line Laser with Plumb Points delivers all-in-one versatility, with highly visible lines and points. They provide horizontal level, vertical alignment and plumb point transfer applications. The tool features Bosch-exclusive VisiMax technology, which monitors tool temperature and power consumption to deliver the brightest line for the job.. The laser features Bosch 12 V Max Lithium-ion power for extended laser runtime during complex or all day layout jobs, provides a visible range of 100 ft. and can work with an optional Bosch laser receiver to extend that range to 165 ft. The Smart Pendulum System self-levels up to ±4°, indicates out-of-level condition and locks for safe tool transport. The manual mode locks lines for use at any angle. The laser comes with the RM 2 Magnetic Rotating Mount that rotates 360°, has a micro-fine adjustment knob and includes a ceiling grid clip. The Bosch GCL100-80CG 12 V Max Green-Beam Connected Cross-Line Laser with Plumb Points delivers all-in-one versatility, with highly visible lines and points. They provide horizontal level, vertical alignment and plumb point transfer applications. The tool features Bosch-exclusive VisiMax technology, which monitors tool temperature and power consumption to deliver the brightest line for the job. The laser projects visible green lines up to 100 ft., which are up to 4X brighter than standard red beams. The laser features Bosch 12 V Max Lithium-ion power for extended laser runtime during complex or all day layout jobs, provides a visible range of 100 ft. and can work with an optional Bosch laser receiver to extend that range to 165 ft. The Smart Pendulum System self-levels up to ±4°, indicates out-of-level condition and locks for safe tool transport. The manual mode locks lines for use at any angle. The laser comes with the RM 2 Magnetic Rotating Mount that rotates 360°..
3-Point Self-Leveling Laser Level Plumb and Level Point Projection Accurately transfers and aligns level, plumb, 90 Degree and grade points. Patented Diamond-Cut Beam Splitter Single diode projects all points for superior accuracy. Smart Pendulum Leveling System - Self-levels senses and indicated out-of level condition, locks when switched off. Robust Over-Moulded Housing - Water and Dust Proof to ensure years of dependable operation. 3-Point Self-Leveling Laser Level is rated 4.2 out of 5 by 97. Rated 5 out of 5 by JM from Just purchased to use instead of a plumb bob to install overhead lighting. The laser speed up th... Just purchased to use instead of a plumb bob to install overhead lighting. The laser speed up the installation process. Not sure where you would really use the horizontal beam portion. Rated 5 out of 5 by Drywallingparatrooper from Very affordable, works great . Very affordable, works great . Rated 5 out of 5 by Erickey from Good product help to get the job done faster better... Good product help to get the job done faster better then levels.